NetEnt released a new online slot game today, Witchcraft Academy. Witchcraft Academy uses 20 lines on 5 reels, which are 4 symbols high. Wins pay anywhere on the reels as long as they are adjacent to each other, so from reel 1 to 5 and reel 5 to 1. The game also features bonus symbols on all reels. If you get 3 or more of them anywhere you will start the Elements Bonus. You get the same picks as bonus symbols that triggered the feature. You pick one of the two characters and they will cast spells. The spells will shatter pots and guard on the board, which will reveal cash rewards. Behind the pots and guard there are free spins extras. If you manage to hit at least 3 of them during this feature you will start the free spins feature with activated bonuses. The bonuses are reel 1 wild, reel 5 wild, a 2x multiplier of 5 or 10 extra free spins. You will get 10 free spins from the start, so you can win 20 in total. During free spins 2, 3, 4 or 5 scatter symbols will award 5, 10, 15 or 20 extra free spins. 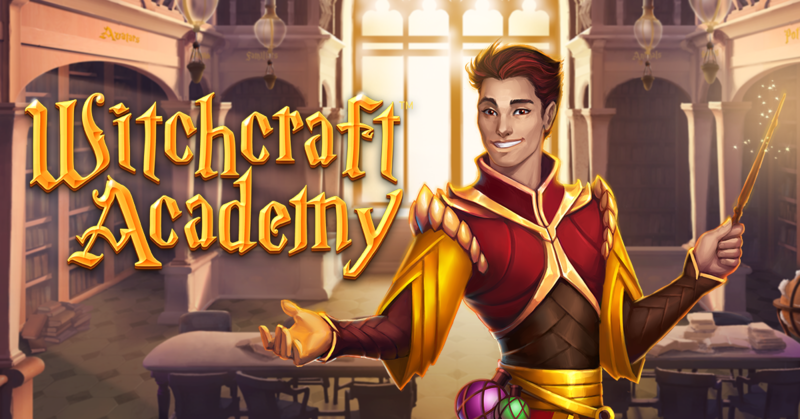 Witchcraft Academy is a nice looking slot game with a very Harry Potter feel to it. The game isn’t really very special, no new features or anything, but it is a solid slot game that a lot of players will enjoy. You can play this new slot game at any NetEnt casino. Be sure to also watch the gameplay video below.